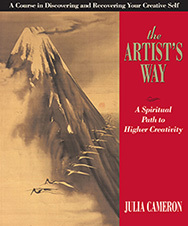 In 1992 Julia Cameron introduced many of us to The Artist’s Way. That year I joined a group of ten women facilitated by a dear friend. We met weekly until we completed the book and the exercises. Our group of eleven bonded so deeply that we continued to meet monthly for over ten years. We would share deliciously nourishing food and talk of the happenings in our lives. Here is a partial list of the many things we learned from Julia. • Morning pages – Before your feet hit the floor in the morning write three pages, long hand. You can and should write anything that is in your head, anything – no one will see them. The first few weeks I found I wrote nothing but complaints. Within that time I could feel shifts happening and shortly there after I was writing about all the things in my life that I loved. It just happened. • Artist Date – This one still isn’t easy but when I do it it is like going on a mini vacation. • Creativity Contract – A contract with “you” committing to the work in the course. • Tasks to do in each chapter – They are many and varied. They will stir your soul and occasionally anger you but you get through it and you grow. • Choose carefully – Those whom you spend time with influence your work and your values. Can you afford to spend time with those who bring you down? Without reservations I believe that when the student is ready the teacher will arrive. Julia Cameron arrived at a fortuitous time for each of us and made a significant impact on all our lives. In a recent guest article for The Word Shark blog I wrote that I believed everyone is innately creative. My intent with this newsletter and my blog is to inspire you to create simply for the joy of creating and to nurture that artist that lives within you. Here is one of the comments from this article. When I paint I feel a pure, gentle love and happiness for this gift that I share. Being an artist is not about how many paintings, recipes or pieces of pottery you turn out. It is all about the process. It doesn’t matter if your piece didn’t turn out and it won’t matter if you agreed to surrender it to someone else. You move on remembering the lessons you’ve learned and the enjoyment of creating. Wherever those strokes come from I know they are meant for someone else. It is as though each painting/mural is a gift I give with a joyful heart. A few years later Julia Cameron wrote another book, The Vein of Gold. In my next post I will share some insights and lessons I learned from that workshop as well. As much as I learned from The Artist Way, in many ways, The Vein of Gold workshop sometimes felt as though I was being tortured. Yet it was life-changing and I am grateful to have persevered. Few people get through this life without struggles. For those who don’t give up you develop grit. Grit is the strength of character it takes to move on. Hi Mickey, from reading your website it sounds and looks like you have been painting a while. Your work is eclectic and I love it. Do you teach? What do you consider your most significant compliment? Thank you for stopping by my website. When I was twenty-four I opened my first studio and taught freehand design on ceramics and porcelain. Now I do private lessons/semi private on occasion. My first love is painting and I find when I teach I don’t have as much time or energy for the painting I love. In my mid-twenties, a woman by the name of Jean strolled into my studio. I asked how I might help her and she said she had heard about me and wanted to see what I did, so I let her browse. After waiting about ten minutes I asked if I could help her with anything, she said “no, thank you” and continued to look. After twenty minutes I asked if I could answer any questions and she said, “I know I could never paint like you but I would like to learn from you.” I asked a few questions and we scheduled her weekly sessions. Jean lived about 15 miles from my studio and came promptly at 7 PM every Thursday. I can’t tell you how many times we had this conversation while she was looking at one of my new samples . . .
Jean Morrison said she would practice and practice she did. Her pieces didn’t look exactly like mine – nor should they have – but they were great. After two years Jean moved forty miles from my studio. For another two years she and now her sister come to class on Thursday evenings. Freddie was a bit more secure with her painting abilities and made some very nice pieces. Then one Thursday evening they came to class and after getting settled in Jean said, “I have something to tell you.” I asked what and she proceeded to tell me that she and her sister would no longer be coming to class. Jean said, “I’m going to open my own studio and teach.” That brought tears to my eyes. After all, this is the woman who didn’t think she could paint and put herself down on a regular basis when she began painting. I gave her a big hug and answered many questions about business that evening and many phone calls after that. It is interesting how life works. Shortly after that night my husband took a job in Colorado and we moved. Jean still crosses my mind but we have lost contact over the years. So Jill, that story about Jean I consider my highest compliment. Thanks for asking. Hi, Everybody! It’s me, Bella. I have a new friend. His name is Boo Galloway, heh, is that not a cool name?!? Met him on my walk last week. He was real friendly and for as long as that guy’s body was, he was pretty low to the ground so we could look into each other’s eyes. He was a cool dude. Oh yeh, I met someone else, too. 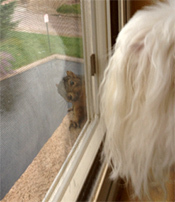 This little critter with the fluffy tail came up to peek into mom’s office window and I sure surprised him! What the heck was Mr. Nosey doing climbing up to the second level. 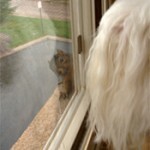 He didn’t stick around after he found out I was on guard duty. colorado and I try all kinds of things to entertain myself. I love when something is out of place on the home front. Mom saw me eyeing her shoes and she asked what I thought I was doing. “Uh, nothin’ mom, why?”, I thought with my most innocent face. Then she turned her back . . . Always happy to reference your great blog! Your recent blog on travel journals is great. You are so engaging with such important thoughts for me and many others. Thanks and do keep me on your mailing list. Loved the little bit about Bella, too! 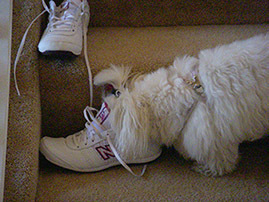 Loved your newsletter, The pic of Bella in the shoe was priceless. So reassuring that someone enjoys the smell of our feet. Sharon S.
Damn, Girl, you are really getting good! The Artist’s Way memory walk was wonderful. Precious days with precious friends. I’m looking forward to next month and The Vein of Gold. 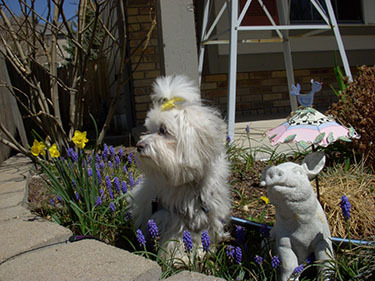 THEN, Bella was in top spirits this edition. She, too has found her voice. I was just ending my day here finishing some stuff and checked a few emails. Yours below really hit a cord with me; and the cord was not off key! You mentioned Julia Cameron and the Morning Pages. I remember you talking before on her book The Artist’s Way and your talking about your daily writing. I got her Right to Write several years ago and I recall she mentioned the Morning Pages there also. Anyhow I sort of did the Morning Pages for a while. And i sort of did not also. Mostly. My point here is I kinda started this morning writing with you mentioning Julia Cameron, and 10 years later I do it pretty regularly. So thank you Mickey. Your newsletter spoke directly to what I was doing before I checked your email. Good to see that Bella is up to herself… I’ll leave out the adjective… Give her a hug for me. I love your blog and appreciate you sharing your great tips! I am going to try it, my mind starts spinning in the morning and when I’m walking or exercising. It’s crazy that I’ve never read The Artist Way, and I know I should! I think having an art group would be way more fun! Looking forward to your thoughts on “The Vein of Gold”! I love the story between you and Jean. It is heartwarming and totally is the reason that us creatives strive to accomplish…to share our passion and talents with others. I am sure that Jean is passing on her talents to another upcoming artist. The Artists Way sounds intriguing, I will need to look into that more. Lastly, your paintings are stunning themselves. You are an amazing artist yourself. Have a great day! About that little grandson of mine with the zebra . . .
No spam, I promise. Just happenings in the studio and things about life and art too good not to share. Never, never, ever will I sell your email address.